How do these seedlings look? I started the majority of my seeds, and I'm just curious if they look alright. I feel like they are a little spindly, but I'm no expert. Also is there one thread for posting seed starting pics in? It seems like everyone has sort of started their own, and I didn't know if I should post my pictures in another thread. 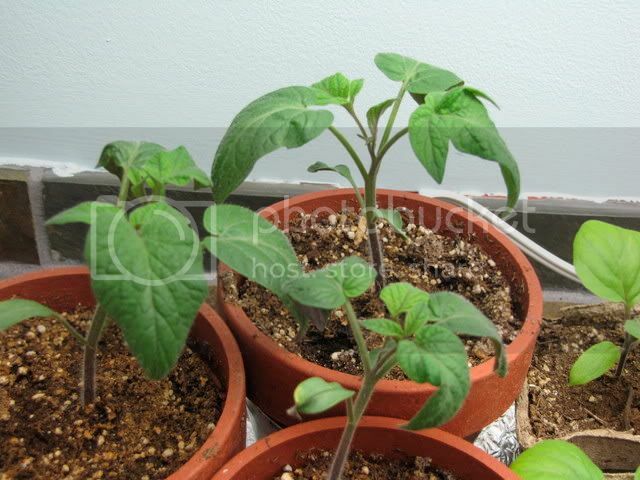 This is a Wisconsin 55 tomato surrounded by black beauty eggplants and purira peppers. I'm drawing a blank on what type of tomatoes these are, but these are some of the ones I'm concerned about being leggy. These are more eggplant pics, and I'm a little worried about these because they are already four weeks old and seem to be growing very slowly. This is the thermometer I keep downstairs in the basement growing spot to make sure it doesn't get too chilly for the plants. These are the upstairs plants which have to stay next to the window because I ran out of space under the lights. This is the space with lights in the basement, with a little air purifier to keep the air moving and clean it up a little. Here is another pic with some very skinny herbs in the foreground. And another picture of the downstairs operation. I'm sorry for the quality of the camera and photography, but I'm no photographer and I did my best! Based upon the photo, looks like the light fixture is way too far above the plants. Should be four inches or closer, especially for the youngest seedlings. The plants don't look too bad though considering the distance from the light source. 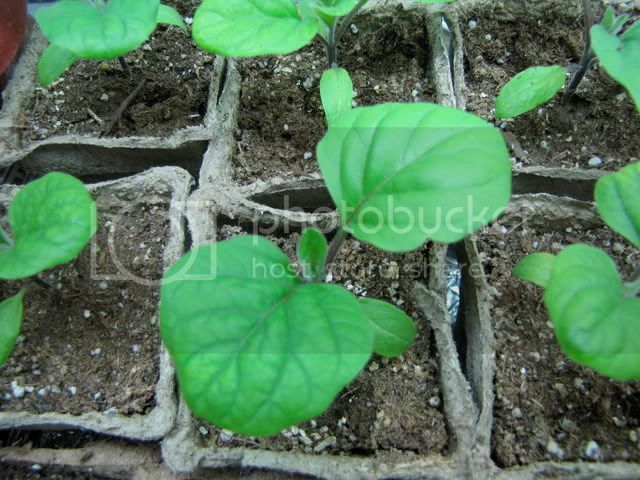 Also the plants look very tender as would be expected when grown primarily under artificial light. Be sure to harden the plants very gradually. 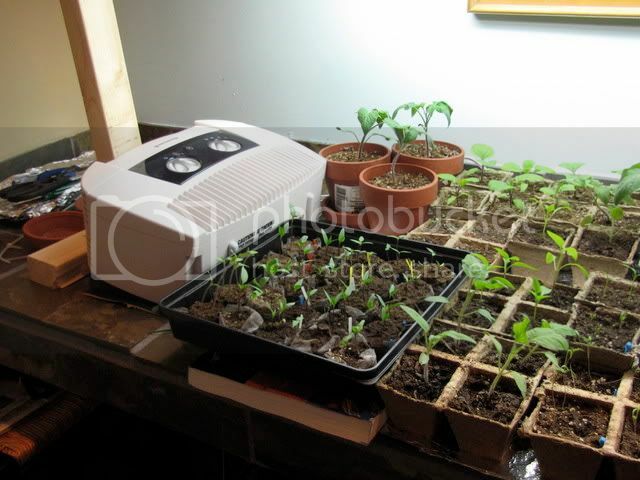 Something like an oscillating fan will help toughen the plants and help get them ready for outside. 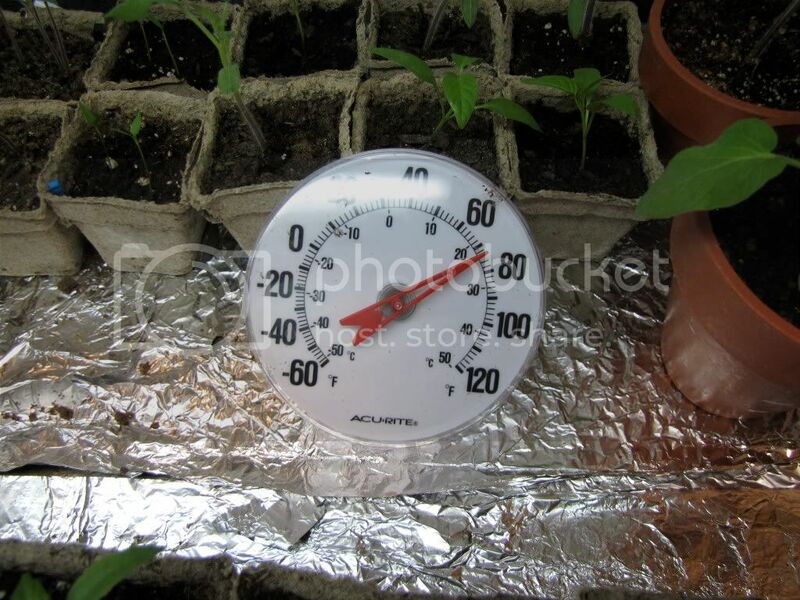 If you can, as soon as you have some sixty plus degree days, move the plants outside to get some natural light, starting with very gradual exposure however. 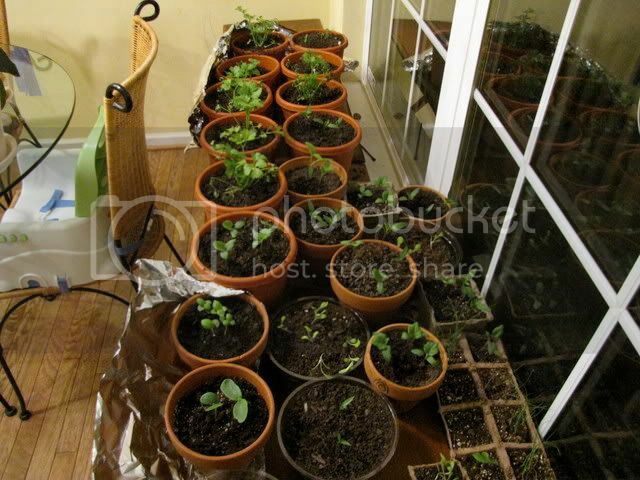 Good luck, looks like you will have some fine plants as long as you take care with the transition to outside. Oh I should have clarified, the lights normally sit about two inches above the plants, I just moved them up to take the pictures. The air purifier does keep the air moving, you can see the smallest plants sway slightly. How much should the air be moving? Should I be able to see the bigger starts sway from the breeze? I've been dying to get them outside but unfortunately the weather here in Philadelphia has been barely reaching 60 for just a few hours a day. The last frost date is supposedly the 17th of April but I'm not sure the plants will be ready by then. I already set out broccoli, cauliflower, and some lettuce starts which don't seem to be doing that well however they are surviving none the less. On a side note, thinking about plants made me want to start a few more seeds, so I just planted 25 more starts with lettuce, roma tomatoes, habanero peppers, parsley and beefsteak tomatoes! I've read several articles in the past, related to the hardening off process. Exact details or techniques vary, but the gist is always the same. A quick google located a pretty good article related to the issue of tender plants and the hardening off process. Here is what the author says about air movement. 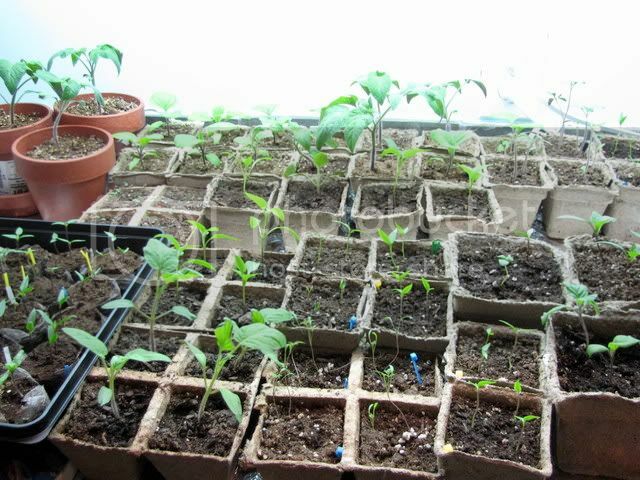 "To best prepare seedlings for the real world, start well before the time most gardening books recommend beginning the hardening-off process. 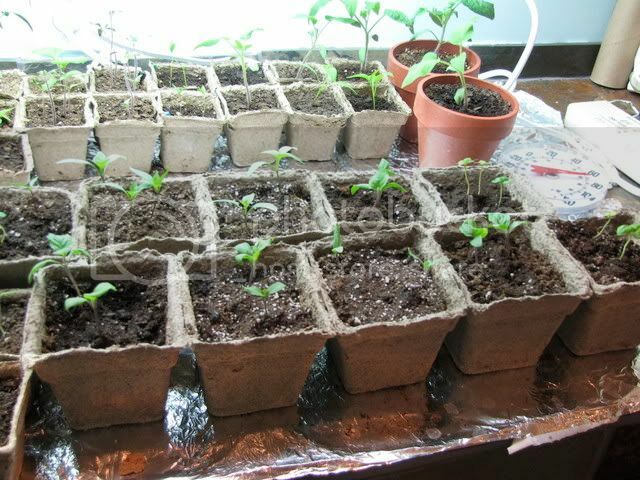 As soon as the seedlings are up provide some sort of mechanical stimulation. 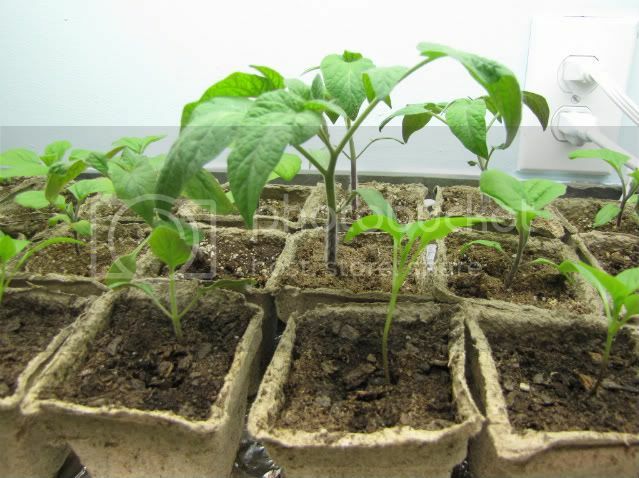 At first, just jiggle the trays and pots enough to make the seedlings quiver. As the plants grow and produce leaves, find a way to move the air around them. A small electric fan stirring the air will do nicely - just don't blast the seedlings to the point that they end up growing sideways. If you use a fan, pay special attention to watering, since the moving air will dry things out faster than would otherwise be the case." 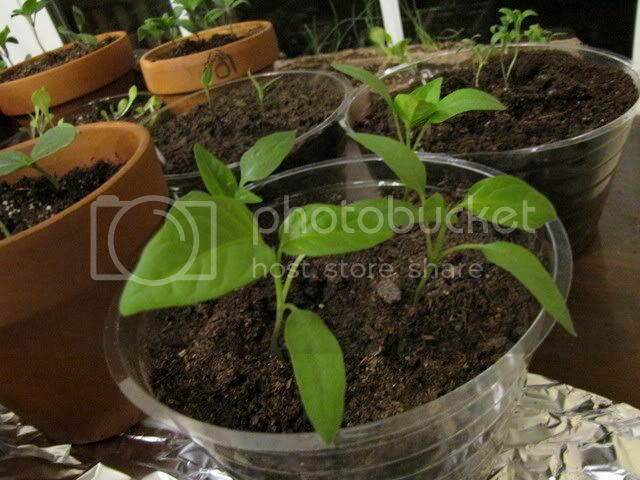 Do pepper seedlings look A LOT like tomato seedlings?